What is “active” vs. “inactive” use? If students know they’re being tracked and want to trick the system, they can log into a Math platform, immediately minimize the screen and then go watch videos for the next hour. SSO, server-based solutions and device management tools will record the “hit” to the math site, and the user data from the math publisher may say they were logged in for over an hour. In every instance, schools are given false data, which will prevent them from making truly informed decisions about that resource, its value as well as its fidelity of use. We worked with our development team, experienced in user analytics from the fintech industry. In doing so, we created collectors that distinguished active vs inactive use, a patent-pending method of measure resource and software adoption never done. Within weeks of implementation, institutions can start making data-driven decisions based on real-time information. Officials will be able to determine what tools are actually being actively used – not merely being opened and minimized – and how long they’re being actively used. 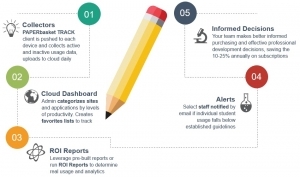 TRACK is an app pushed to any school device selected by officials, and allows schools to collect active and inactive use data across all web sites and installed applications across multiple operating systems likely found in your institution. Our system does not collect personally identifiable information on users. 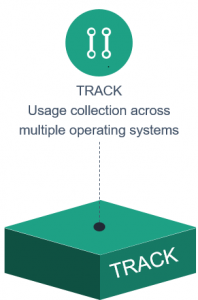 We have built TRACK for multiple operating systems. Unlike passive DNS models, this collects data on software locally-run on each device, as well as all activity done outside your school network, giving you a 360-degree view of device usage. For student privacy, we only track the device with its unique address. REPORT allows district and school-level officials to analyze adoption, see what tools are and are not being used. Officials can easily customize report screens to get instant access to the reports needed most in their respective roles. You can even get a financial projection on the actual ROI for any fee-based subscriptions your institution is paying for. Via open API standards, CONNECT allows officials to easily integrate PAPERbasket data into the data-driven decision making platform your institution currently uses. With this additional data, your leaders can make more informed decisions about edtech adoption, integration and overall change management for all stakeholders. In this age of multi-tasking, students can have dozens of apps and sites open in the background. We tell you which is actually being used. Real Data. Real Life Ways. The district’s Chief Academic Officer wants to see if teachers who completed a professional development workshop on a new LMS are actually using the system. She is checking the number of logins and seeing if teachers are using it at least for 30 minutes, a goal for all session attendees. In advance of this evening’s board of education meeting, the Superintendent runs a report demonstrating that middle school students taking part in their 1-to-1 program are spending more time this past month on academically effective sites and applications versus earlier in the school year. Ongoing reports like this help provide objective and accurate proof that the school system is getting results with taxpayer dollars. Using cumulative data from the entire school year, the Chief Information Officer conducts an ROI report of an upcoming Math online platform that is up for annual renewal. 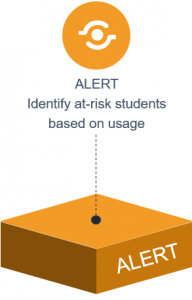 The automatic report determines that only 7% of students met established usage goals and the overall adoption rate was only 28%. The CIO shares this information with the CFO. After receiving a report a few minutes ago, the Chief Financial Officer speaks with the CAO to try and determine why this new math platform is not seeing strong user adoption. Concerns over the system’s ease of use are discussed. The CFO contacts the sales representative of the math company, sharing the usage data. Before the district will consider renewing, the district requests a reduction in the fee for the next 12 months, using those funds for additional teacher training. Using the ALERT functionality, the high school Principal is notified earlier in the day by the district education technology team that five students showed substantial drops this month using their school computing device for academic work. The Principal, after conferring with their guidance counselor, calls two of the parents to make them aware of the behavior.